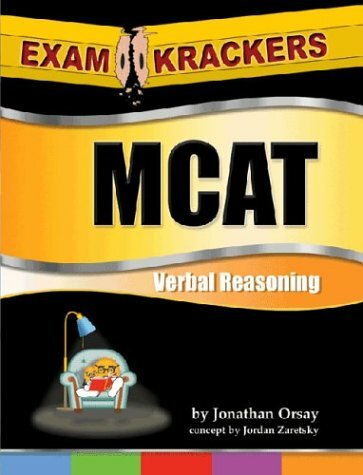 Synopsis: This book explains the most effective strategy for scoring well on the MCAT verbal reasoning section. It is the same strategy used by the author, who scored a perfect score on that same section. Excerpt. © Reprinted by permission. All rights reserved.&colon; For most students, the Verbal Reasoning Section is literally a test of their ability to comprehend what they have read. Such students read a question and choose the correct answer based upon what was said in the passage. If they do not arrive at an answer, they eliminate answer choices based upon what was said in the passage. If they still don’t arrive at an answer, they search the passage for relevant information that they may have missed or don’t recall. If they still don’t arrive at a single answer choice, which is likely to be about 50% of the time with this method, they repeat the process until they give up and make a random guess in frustration. This method uses only about 50% of the information provided by the test. When you consider that a portion of the questions on a multiple choice test will be answered correctly by luck, it’s no coincidence that the national mean score on the MCAT is attainable by answering only about 61% of the questions correctly. When you can’t identify an answer, ‘thinking harder’ (whatever that means) is not an effective solution. Nor is an effective solution to search the passage until the answer jumps out at you. However, both use up your precious time. In addition to your understanding of the passage, there are four tools that you should use to help you answer the questions. These four tools go beyond your understanding of the passage. They force you to consider additional information presented to you in the question stems and answer choices that is often overlooked or otherwise noticed only on a subconscious level.